DALLAS (AP) — The surprisingly close U.S. Senate race in Texas is growing more combative, and Republican Sen. Ted Cruz and Democratic Congressman Beto O’Rourke are staking their chances on two sharply different visions of America. 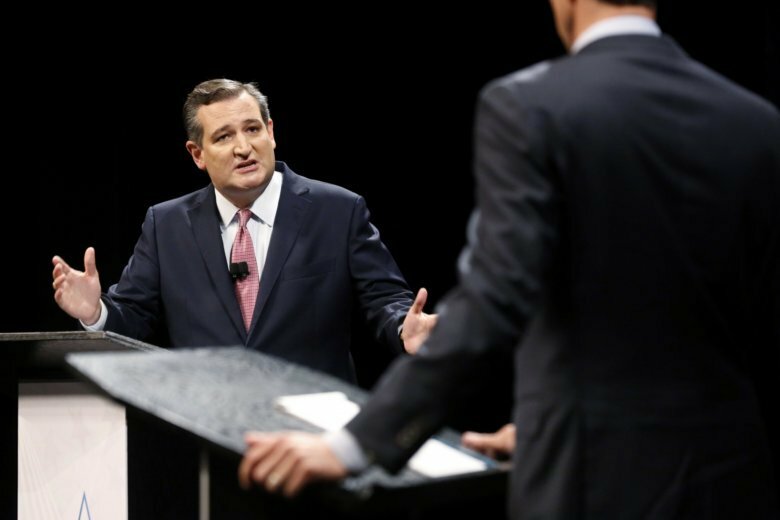 Their first debate Friday night reinforced Cruz’s doubling down on unabashed conservatism that has proved a winner in Texas for decades, offering no compromise on hardline immigration measures or gun control, months after a mass shooting at a high school near Houston. And in Dallas, where the debate was held amid simmering tensions over a white police officer fatally shooting an unarmed black neighbor in his apartment , Cruz didn’t answer directly when asked whether police violence against unarmed African-Americans was a problem across the country. O’Rourke, meanwhile, stuck with his gambit that Texas is ready to swing left while defending his support of legalizing marijuana and universal health care. For however many voters were watching on a Friday night — when the focus of many Texans is on high school football — there was little appeal from either candidate to a middle ground. Cruz, who acknowledged during the hourlong event at Southern Methodist University that O’Rourke is giving him a “real race,” is banking his re-election on energizing Republican voters who have denied Texas Democrats from winning any statewide office in the last 25 years. O’Rourke, meanwhile, needs an overwhelming Democratic turnout and big gains in Texas’ conservative suburbs. But Cruz often put him on the defensive, clouding his positive message, and the Democrat defended policy positions that even GOP moderates might have difficulty unifying around. Cruz went on the attack moments after stepping on the stage, charging that his opponent suggested that police officers embodied “modern-day Jim Crow” laws in response to a question about Amber Guyger, the officer accused of shooting of her neighbor. O’Rourke responded that the accusation was “simply not true.” Cruz appeared to be referring to O’Rourke previously suggesting that inherent biases in the criminal justice system promote racism. When Cruz tried to say O’Rourke wanted to abolish the Second Amendment, the Democrat said it wasn’t so, and the candidates sniped while the moderators pleaded for them to stop and for the audience to stop hooting. O’Rourke said Texas was ready for a senator who will protect the Second Amendment while imposing small restrictions to save lives and prevent mass shootings. He suggested those were supported by “gunowners and non-gunowners alike,” but when he said the common GOP refrain after gun violence of offering “thoughts and prayers” wasn’t enough, Cruz bristled. Cruz was also asked whether Supreme Court nominee Brett Kavanaugh’s accuser could say anything that might make him question his support for the nomination. Cruz said “absolutely,” but didn’t elaborate while calling the allegations serious. The pair will square off again next weekend in Cruz’s hometown of Houston, and a third and final debate is set for San Antonio three weeks before the Nov. 6 election. An ex-punk rocker who has attracted glowing attention from national liberal circles for his high-energy campaign and monster fundraising, O’Rourke has been mentioned as a possible 2020 Democratic vice presidential candidate and even a 2020 White House hopeful. Though he may not knock off Cruz, the argument goes, a close loss could only further boost his national profile. Cruz finished second in the 2016 Republican presidential primary. But a variety of polls show that O’Rourke is staying within striking distance — prompting Cruz to go negative in ads lately, attacking his opponent for defending NFL players’ right to protest during the national anthem and his opposition to the Trump administration’s hardline stance on immigration. President Donald Trump has announced that he’ll rally in Texas for his once bitter rival Cruz next month — previously unthinkable in a state where Republicans usually rack up landslide victories. Weber reported from Austin, Texas.